On this page I put together a collection of uniform motion problems to help you understand uniform motion better. Uniform motion is motion in a straight line at constant velocity. 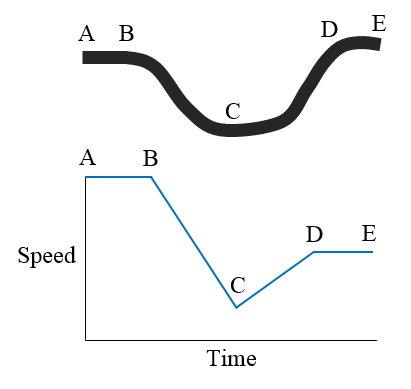 The figure below shows the road that a car travels and the corresponding speed versus time graph for the car. Between which two points is the car experiencing uniform motion? 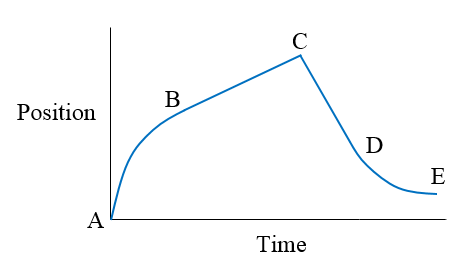 The figure below shows the position versus time graph for a car traveling on a straight road. Between which two points is the car experiencing uniform motion? In the previous problem, at which point does the car change its direction of motion? For the car to experience uniform motion, it has to move in a straight line AND travel at constant speed. This is only true between the points A and B. The car experiences uniform motion in locations where the slope of the line is constant, which is between points B and C, and between points C and D.
At point C, the slope of the line changes, which means that the velocity of the car transitions from positive to negative. This means that the car reverses its travel direction. Note that the cusp at point C is not very realistic. In reality, there would be a more gradual transition in velocity as the slope changes from positive to negative.